Price is per four nuggets. Each is a different shape and size, but average measures about 30mm x 22mm x 12mm, drilled from top-to-bottom ready to thread. A little lighter in real life, than the picture. Blue lace agate is known as the "Gem of Ecology" because of the swirling blues and whites which resemble clouds above the Earth (the fragile blue marble) as seen from space. 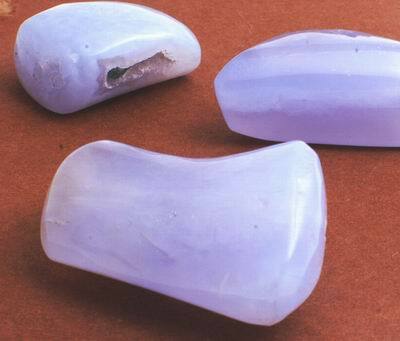 Blue lace agate is a gentle, calming stone. Some say it can assist astral projection, help communicate with angels, and activate the throat chakra. It also strengthens intuition and inner knowing - and reduce or cure stuttering and other nervous speech habits. Agate was highly valued as a talisman and a traveler’s amulet since ancient times. It’s believed to bring good fortune, health, wealth and long life - as well as quenching thirst and preventing fever. Persian magicians used agate to divert storms, and athletes to increase vitality. It's also said to bring self-confidence by reducing fear.